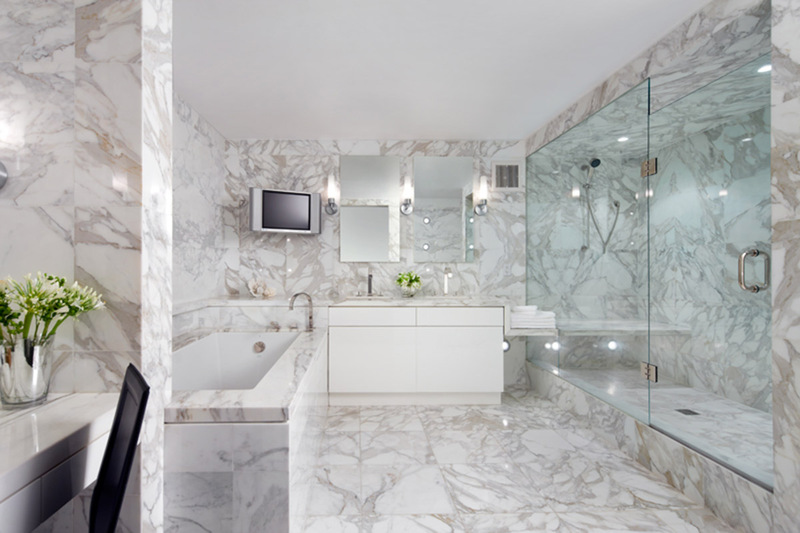 So the designers suggested creating two closed bedrooms with their own bathrooms, then integrating the kitchen, dining room and living room into “one happy space.” The main challenge of knocking down walls and undertaking major construction work within a condo building is not disturbing the other occupants. “You can’t make noise early in the morning and the contract workers have to be very cognizant of the importance of good neighbourly relations,” warns Mockler. That’s why Mitch Kleinstein was hired for the job—reputed for his sensitivity and extensive experience in condo renovations. And then there was the question of how to illuminate the space beautifully, given that the ceiling was a concrete slab coated in plaster into which drilling was not allowed. Recessed lighting was not an option, but the design team came up with interesting alternatives. They created a custom light fixture, cantilevered off the wall, to showcase the large-scale Uno Hoffmann piece in the living area. 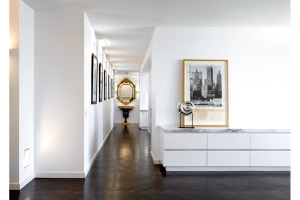 A series of wall-mounted gallery lights the length of the hallways were installed in anticipation of the homeowner hanging a growing collection of artworks there. In the kitchen and dining areas, a floating canopy allowed concealed junction boxes and wires to be installed so that the counters and dining room table could be lit from above. The bonus of this necessity-driven feature: the slightly lower ceilings subtly defined the cooking and eating areas without the need for walls. The original herringbone hardwood flooring was left intact throughout the living and sleeping areas – it adds interesting texture and pattern to the otherwise minimalist space. “The general idea we had was that the apartment would be rather Corbusian,” says Mockler. “So we went with pure white walls and ceilings against which the fine pieces of furniture and colourful spines of the extensive book collection would pop.” In the main living area, a grey Flexform sofa faces black leather Minotti chairs across a modern B&B Italia coffee table. Soft and pliable, the sofa is not just elegant but also extremely comfortable. The chairs swivel, allowing the homeowner to face the wood-burning fire or the city. Before the renos, walls flanked the fireplace, but it was a conscious decision to make it more discrete and ambient. “In the past people sat around the hearth for warmth and it was a focal point of the room,” says Mockler. “Nowadays, we have so much more going on, between iPads, city lights and TV, that we think of it as being there more to create a glow in the background.” An avid reader, the homeowner’s favourite spot in the house is the library/dining room. “When I come home after work, the first thing I do is sit down to read the newspaper and later a good book,” he says. After dinner, he tends to catch up on the news off to the side of the main seating area in his media corner with its 72-inch screen TV.